Two middle-aged victims of the war of the sexes, Paul and Albert (Jean-Pierre Marielle and Jean Rochefort) run away from their families at the same time. They indulge themselves by eating what they want to, when and where it pleases them. Calm is what they want. But soon their example inspires thousands of disorientated males, fleeing the feminist 1970s. Soon, too, there arrives a squadron of nymphomaniac Amazons. Hoho! I originally saw this film in a theatre with English subtitles, thought it was most enjoyably outrageouss and funny, and have been looking for an English subtitled version ever since, but to no avail... until you did this NTSC DVD, finally subtitled in English! Thank you! It's still a pretty funny film, in a really good color print. Now, please re-release NTSC/Eng. subtitled DVD of Italian director Alberto Lattuada's really fine 1957 film "Guendalina", actually an early favorite of film critic Pauline Kael. Great transaction. Movie was delivered promptly, exactly as described. I was searching for this film for ages & will definitely look to Movie Detective in the future. 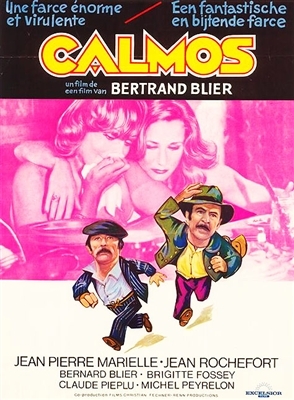 2 years after Going Places (les Valseuses), Blier kept bringing political incorrectness to french screens somewhere in between May 68 and the election of Mitterand as President. This film is so hilarious, so adept at its very UNIQUE way of poking fun at men and male-female relationships, and so...FRENCH, I'll be forever grateful that I bought it rather than visiting our insanely great local Portland, Oregon movie treasure chest, Movie Madness, and renting it. And Movie Detective, the product and your service were both A+! !